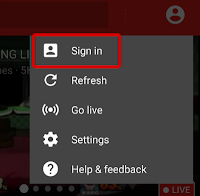 Open the YouTube Gaming app, tap your channel icon at top right, and select "Go Live"
Start the recording - everything on screen will be recorded so be careful! 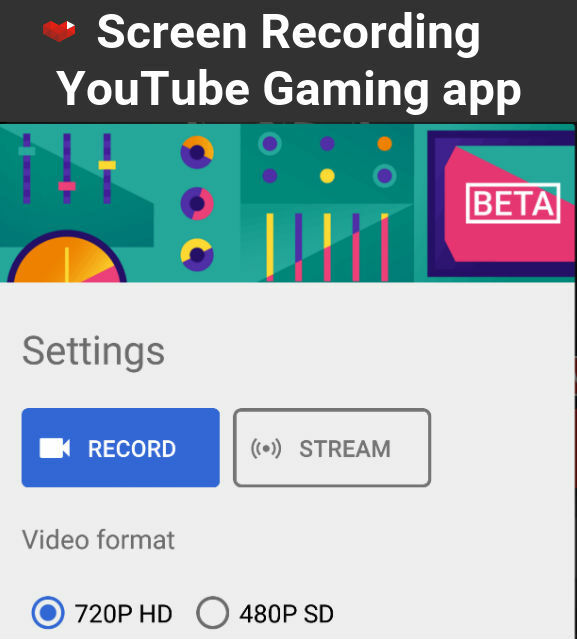 The YouTube Gaming app records the video, which will then be uploaded to your YouTube channel using the YouTube app . 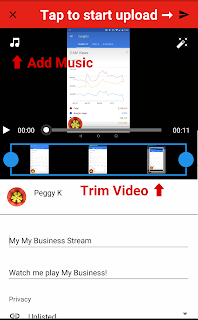 The video recording is stored in your device's Screencasts directory, and you can uploaded to any other app you choose. 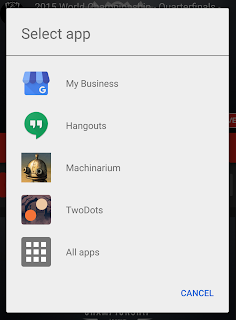 If you have Google Photos auto-backup enabled, you can set the Screencasts directory to automatically back up to your Google account. When you record your screen you can choose to display either your live front-facing camera image, or your channel icon. 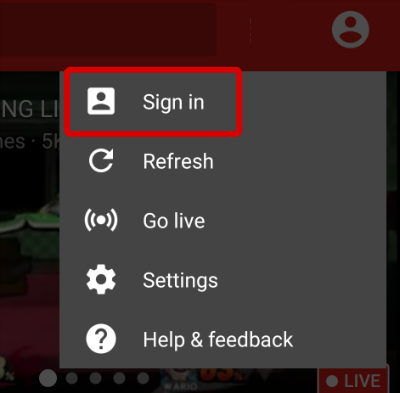 If you don't plan to have the camera on, be sure to sign in to YouTube Gaming with the channel you want to display. 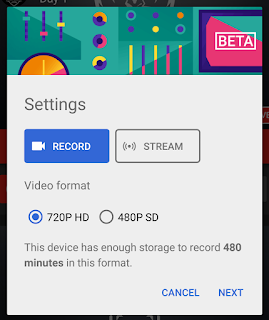 When you end the recording, you will be prompted to save your video to YouTube using the channel you have signed in to the YouTube app. 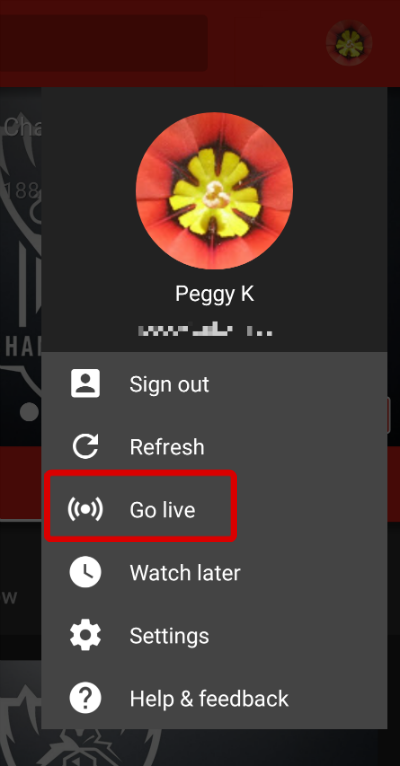 The "Go live" option is for both recording and live broadcasting. You can also select the video format - 720P or 420P. Make note of how much storage is available on your device! 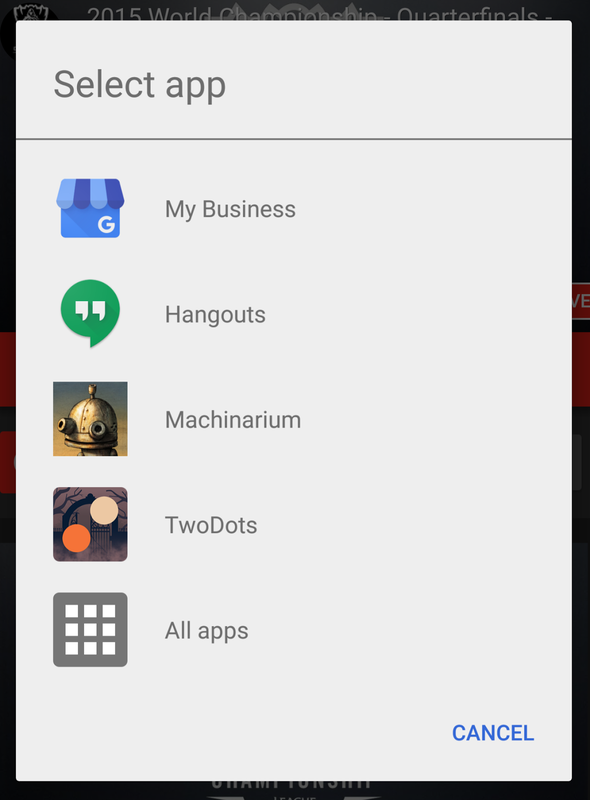 You can access any app on your device by scrolling to the bottom of the list and tapping All Apps. Once you select an app you can navigate anywhere on your device. Some apps may not work, especially if they also need to access your phone's camera. 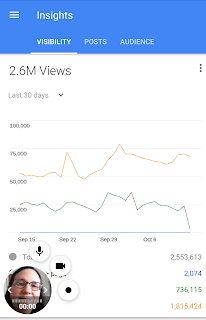 I was able to record a Hangouts chat, but a Hangouts video call quit the recording. Note: Once you start recording everything will be captured, including notifications and any visible personal information. You may want to temporarily disable notifications while recording or broadcasting. Tap the red circle to see your options. The default is to show a live feed of your front-facing camera. If you don't want to show your face, turn off the camera by tapping the video cam icon. 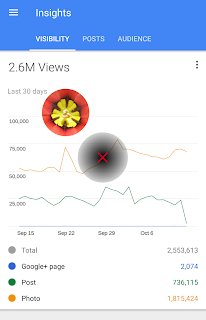 Your channel icon will display in place of your camera feed. You can position the video or channel icon in any corner of the screen. Drag it to the middle - to the gray circle with a red X - to cancel recording. If you don't want the microphone to record, tap the microphone icon. Note that all audio recording is through your device's microphone, so plugging in a headset will also prevent any audio from recording. 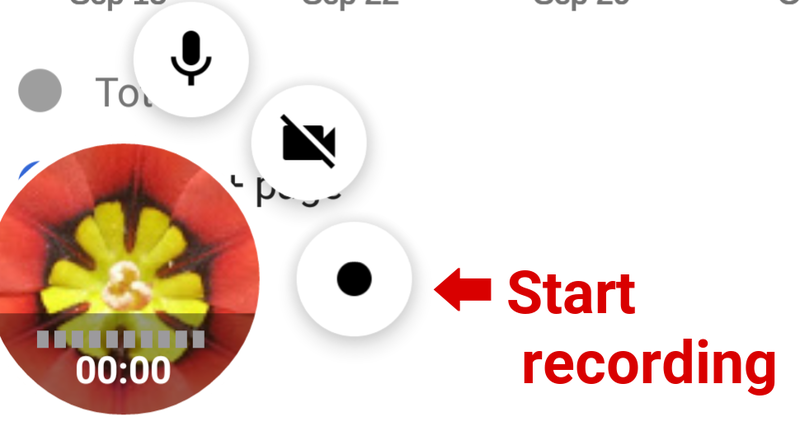 Tap the circle icon to start recording. Everything on screen will be recorded, including notifications, incoming phone calls and personal information in the apps. 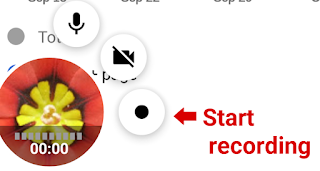 When you are recording, a red dot will display next to your video or channel icon. Tap it once to display your options, then tap the square icon to stop recording. Check that the channel name and icon are correct. The video will be saved to the channel you are signed into in the YouTube app, which may not be the same as the channel you are signed into in the YouTube Gaming app. 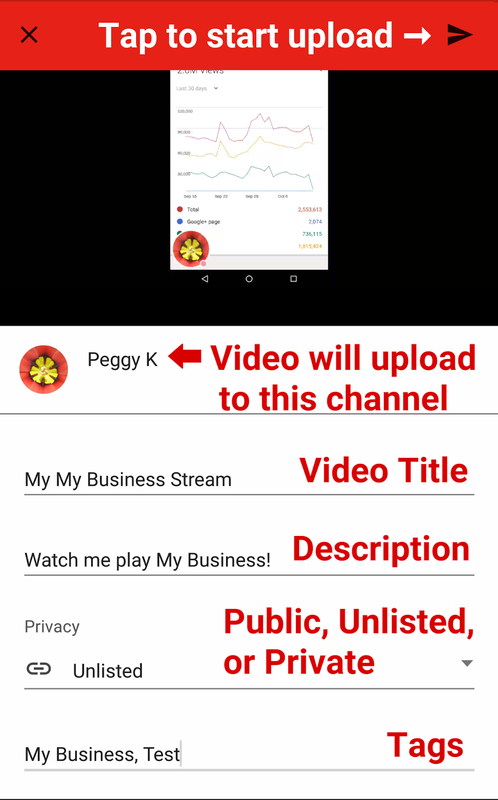 Add a title - the default is "My [name of selected app] Stream"
Add a description - the default is "Watch me play [name of selected app]! 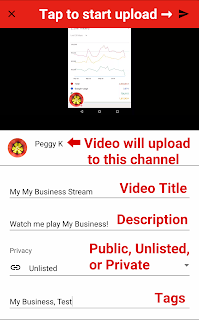 Your video will be uploaded to YouTube and you can manage your video in the YouTube Creator Studio app on your mobile device or in your channel's Video Manager on desktop. What does the finished video look like? Here's my first attempt. 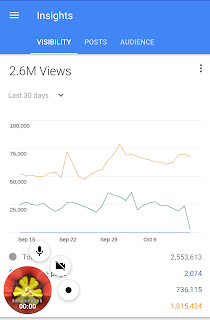 It's a brief tour of Google+ Page Insights in the Google My Business app.